The word on the street is that QR codes are out, and Google goggles are in. I stumbled upon this article, showcasing some epic QR code failures of last year and felt inspired to write about the topic. QR codes are not a new technology, but new to the average consumer like you and me over here in the US. They originated overseas in Japan, being used for over a decade by Dens0 Wave. There are people who swear by them and others who think the abstract black and white shapes are useless. I am still researching both sides of the argument, but at this point in time I consider them cumbersome and irrelevant. Why? Let’s look at some key points. These little squares store data, but we don’t know what exactly that data is. We take a chance by scanning it into our devices on a hope and a prayer we don’t end up on some malicious site. Or worse, becoming a victim of identify theft as some codes can gain full access to your phones data. Humans are visual (and visceral) animals. We just simply cannot make an emotional connections to an abstract black and white square. They resemble nothing to do with the product or service being advertised. Purchase decisions are driven by emotion not logic. We need stimulating imagery and color. About 5-10% of the American public has ever scanned a QR code. The only reason why most people scan them is to secure a discount or coupon, and that is one of the only reasons I would personally ever scan one. This article highlights some rather dubious uses of QR codes. So, in the beginning I mentioned that Google Goggles are the new “QR code”. I have experimented with both and have to agree, Google Goggles are much more simple and secure and FUN! There are no risks of getting sucked into malware sites or anything of that nature. You simply pick something to scan and information is safely at your fingertips. Scan anything from text, books, landmarks, art, food, beverage, labels, etc. 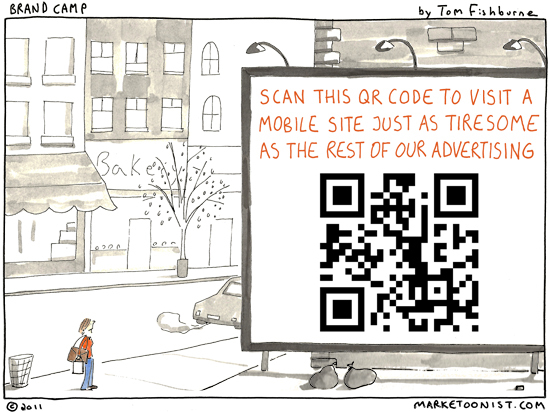 So what has been your experience with QR codes or Google Goggles? I would love to hear other points of view. Dr. Pepper 10 macho madness? Whoa! This is crazy, thanks for sharing!